Emily Howard Meyer our Cantorial Soloist and Music Educator will lead services the first and third Shabbat of each month including First Friday and Shir Shalom Shabbats. She has taken over leading all three choirs. In addition she will continue teaching music and Hebrew in the Religious School. Emily will also help lead us in music for the High Holy Days. Emily is an accomplished composer, arranger, conductor, teacher, singer and pianist. She received a double Bachelor of Music degree in Piano Performance and Theory/Composition at the University of Northern Colorado in Greeley and a Masters of Music in Composition from the Peabody Conservatory of the Johns Hopkins University. She has studied with composers Robert Ehle, Jean Echleberger-Ivey, Ronald Caltabiano and Chen Yi. An avid teacher, Emily has taught all aspects of music at Eastern Wyoming College, Finger Lakes Community College and at the Omaha Conservatory of Music. 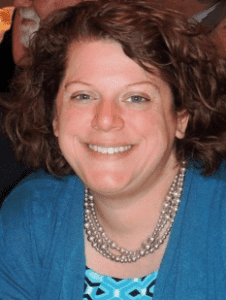 She has also shared her love of Jewish music as a religious school specialist at Temple Israel and Beth El Synagogues of Omaha, NE, Shaare Torah in Gaithersburg, MD, and B’nai Tzedek in Potomac, MD.